I got a package last week from my Hogwarts Sock Kit Swap 3 Pal! You know are you jealous. Thanks so much to Jen C for the awesome kit. 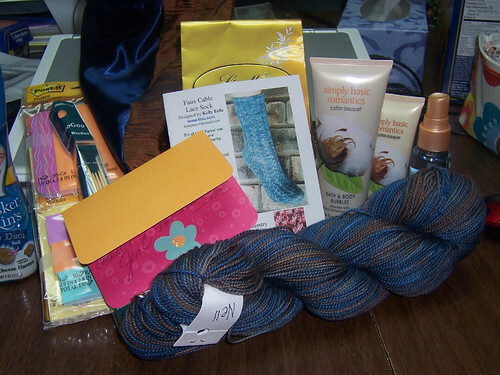 I think it was a good thing for me to switch to Ravenclaw for this round, because the yarn I got was GORGEOUS. I looove it. And Jen also managed to pick out something I'd never smelled before and totally get something I liked. This may have been luck, or she may have been skilled, but I'm certainly thrilled no matter what. My pal's stuff is going out this week, along with my Hogwarts Sock Swap pal's stuff as well. I'm still waffling on which yarn to give my sock pal, because I have separation anxiety about yarn. I'm weird, I know. 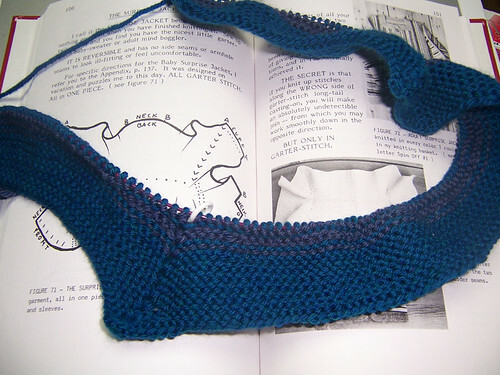 I like how it turned out, though I'm not crazy about how my neckline turned out. I think my cast-on got too tight at some point, so the back of the neck isn't as stretchy as the front, but it still looks OK and will not be noticeable on the baby, so I don't mind. I am probably going to make another one, because I do have enough of the Swish Superwash to make another. I'm starting to freak out just a bit that the Swish will not live up to the "superwash" thing, so I'm thinking I'll just put hand wash on them. It won't be the end of the world if it gets accidentally washed, but I don't want to disappoint Ivory. I'm hoping we can sort of be friends, you know? Wives of the Tudor boys and all that. And I know she'd feel bad if she washed it and it shrunk before Elijah gets too big for it. Anyhow, I'm off to finish boxing up my Hogwarts swaps stuff. I'm going to make Jeremy mail them out tomorrow, and then HOPEFULLY I'll be able to go through all my yarn and start pulling out stuff for destash on Etsy. I need to do a major destash before I go back to New York. 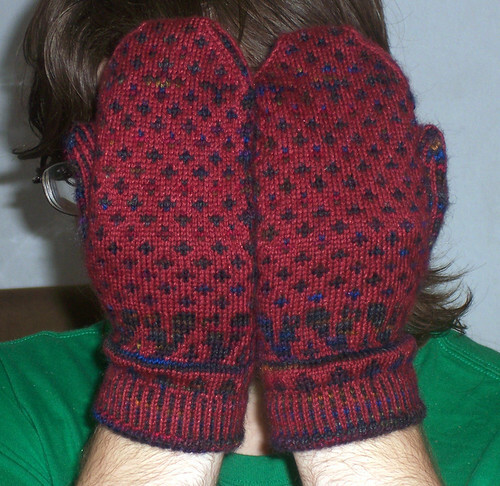 And some mittens from the mitten swap I did. I think I'm definitely into doing another one of these. I've decided you can't have too many pairs. 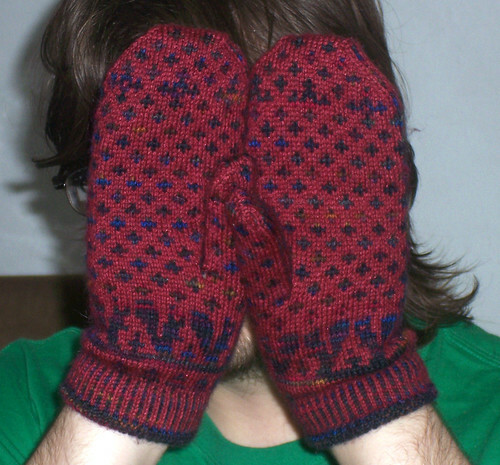 I finished the mittens for my pal. I have also shipped them. 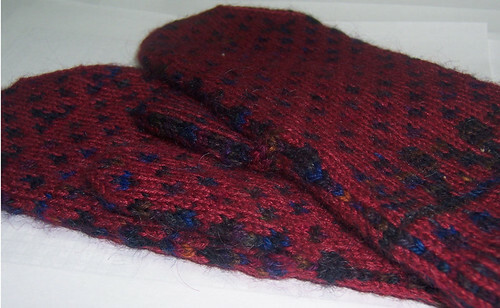 Today is actually a very good day, as I have been let off work early (they let us go home if there's not a lot to do) and am now at home, quite close (in my opinion) to finishing a baby surprise jacket. It's all wonderfully fun. 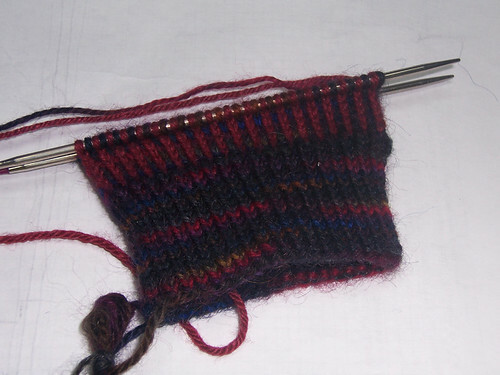 Sea Wool Bordello Sock is in stock over at The Loopy Ewe and I can't buy any. 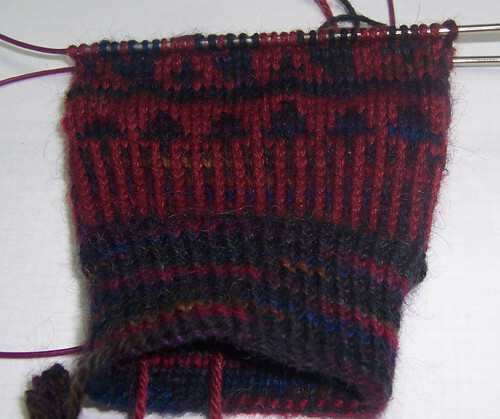 In other news, knitting is done on the fair isle mittens. I'm weaving my ends in now and will be blocking them later today or tomorrow. Huzzah. I'm sure this had something to do with the chicken-themed sock camp that they had but is anyone else disturbed by the large number (I counted 11) of poultry-themed colors over at Blue Moon Fiber Arts? 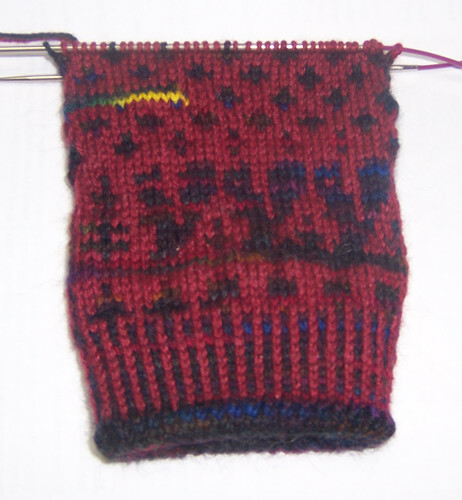 I am also not working on my baby surprise jacket, because I realized I need to have my mittens for mittenswap done by the 15th so I started those. progress here. I know, I rave about her. 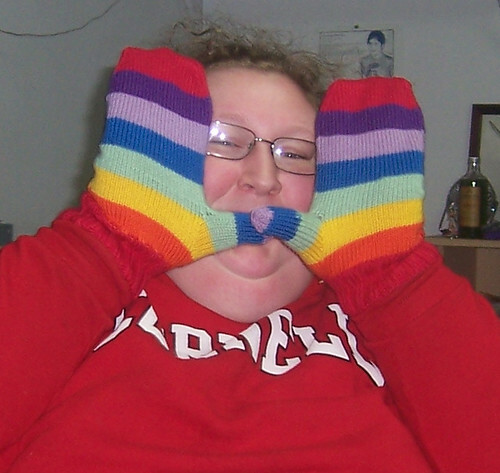 Elizabeth Zimmerman is practically a goddess to me. When I posted on Zimmermaniacs and got a response from Meg Swansen (daughter of EZ) I practically squee'd myself out of my own body. I get that response sometimes- it's the reaction to the people who are celebrities in my own mind- people whose work I love, people who I never thought I'd meet, etc. I had similar reactions to Bill Nye and John Cleese when I met them during college. But I digress.. I started a baby surprise jacket today. It's one of EZ's more popular pattern. I have always been amazed by it- if you're familiar at all with the E.Z. phenomenon you'll realize that the Baby Surprise Jacket (or BSJ for short) is what a lot of people call a knitting miracle. 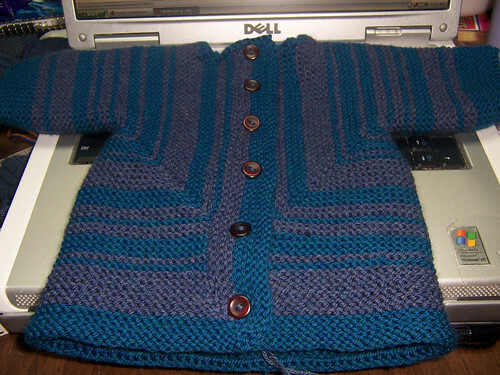 You basically knit this big garter stitch thing that becomes a baby jacket. I'm obviously not that far. But if you want to see some finished photos of the jacket, check here. It's really amazing. So, in short.. EZ is the BOMB. Seriously. I could probably write a whole book about how much I love her, but right now I'm just sticking with the jacket. It's going to be cute. So I'm finally starting on a Baby Surprise Jacket for Elijah. I'll probably do a few other little things but this is going to be the last big thing for the baby. Anyhow.. 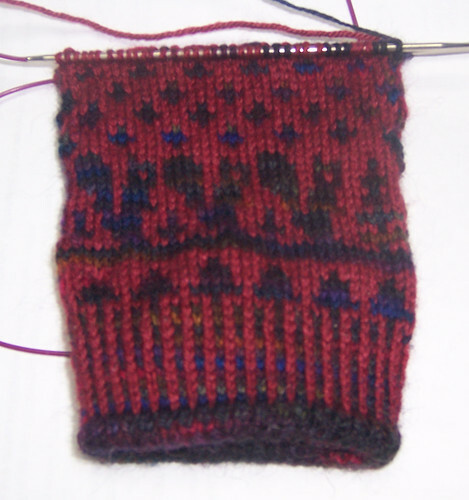 I bought some Swish Superwash in Marine Heather & Delft Heather and it's really pleasant to work with. Very soft. I just hope it stands up as well in the wash as it claims to. Also, the heathering effect? Very pretty. Subtle, but pretty and wonderful. It practically sparkles. Band - This one is hard.. right now Tatu..
Book - Too hard. I have too many. Lotion - Vaseline intensive care. Anyway, not a lot of knitting getting done- I'm feeling really crappy due to head cold and putting off contacting Cornell.. buts I need to.